Welcome to the Sea Mother’s Moon! Potent Full Moon at 18° Cancer on January 8th (or 9th; exact date depends on geography). Our meditation this Full Moon is FLOW. The potency of this Full Moon relates to many astrological details but, as you’ve noticed, Yogastrology tends not to over-do the astro-details—we get right to the point. How to best use celestial energies to improve health, enhance lives, increase well-being on our planet? Cancer is one of the Water signs, an indicatator of heightened emotions. E-motion is in motion. FLOWing. Nurturing and tender. But, in the sign of Cancer, if we aren’t careful all this can seep into a clingy sort of insecurity. 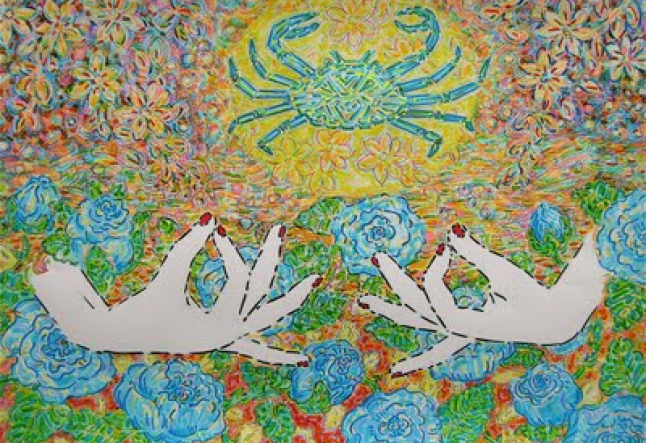 Like those crab claws that symbolize Cancer, grasping and smothering, rather than mothering. Drowning, rather than cleansing. Caught in the waves, carried out to sea. If you're land-locked this Full Moon, try cranking up a tabletop water fountain at home or in your studio. In other words, anything connected with water will work. And buy flowers. Light candles. Dress up, and dance. Swirl feather boas and get into the FLOW. Imagine a Moon goddess comes to your party; prepare something beautiful for her, and for you. Feed one another (Cancer loves to cook and eat); warm nourishing comfort-food, yum. Be sure to add asana to the mix too. A few well-chosen poses open the heart. Cancer rules the chest and breasts. Let’s focus our asana practice on the breast-and-chest area—and open our hearts to this Sea Mother’s Moon. Heart-opener backbending poses can bring us into communion with heaven. Sky. God. Source. FLOW. Whatever one wishes to call that which inspires the Sun to shine, and the Moon to glow, let it lift our hearts. Bend back, and open. Camel Pose. Perfect pose; brilliant backbend. Fish Pose. Nice for Water signs, especially this Full Moon in Cancer. Mountain Brook. This highly effective restorative pose requires a simple prop: rolled towel, blanket, or yoga mat. Feel yourself being coaxed into the FLOW of heart opening. Fabulous. (See asana for zodiac sign Cancer here). The Sea Mother’s Moon invites us to open to life—all life—to acknowledge the perils, and we keep going and keep FLOWing anyway. Um, she meant merge, right? Keep FLOWing! Such is life. Wide and true.